Do you need braces? Does the thought of metal tracks put you off? Perhaps you just can’t picture what you’ll look like with braces. Sometimes worrying about how we’ll look with braces can hold us back from taking that leap towards a healthier smile. Well, the good news is there are apps for that! Whether you’re considering braces for yourself or your children, your entire journey can start with an app, such as Brace Yourself. The app lets you quickly and easily try out different options before you commit to any procedures. With Brace Yourself, you can preview your smile with braces on your smart phone. There are 30 different types of braces to try out, so there’s no doubt you’ll find the one you like. It’s a great way to see exactly how you’ll look with braces. 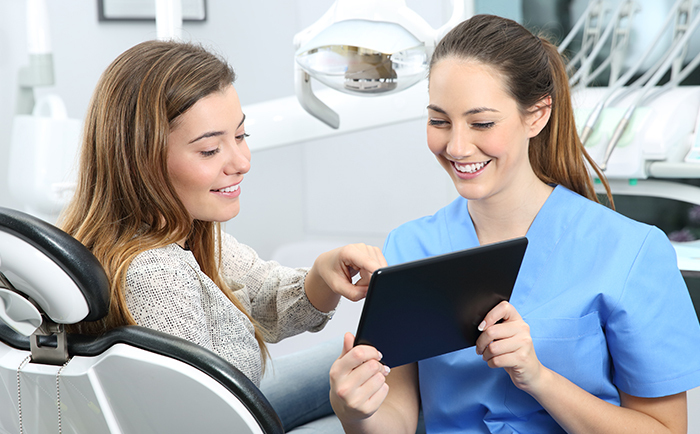 In fact, with these kinds of apps, along with your orthodontists’ programmes for showing you how you’ll look, you can see how different types of orthodontics will look on you. It’s a great way to make a choice in orthodontic treatment (coupled of course with your orthodontist’s advice) that will suit your lifestyle. The photos present a preview at how you will look. And your orthodontist’s programmes will even show you how your smile will progress during your treatment. Smile apps are quick and easy to use. Just follow the steps to start exploring how you’ll look with different orthodontic options. You can switch them out as often as you like, and when you find the one that works for you, save the image. Take it along to your next appointment to discuss whether or not it’s the right treatment for your smile. When all is good, save the image and share it with your orthodontist! Once you’ve seen how you’ll look with braces, you can discuss your options with your orthodontist. Better yet, let your orthodontist work the app with you to find your smile solution! Book an appointment at Medland Orthodontics today to discuss your smile options.